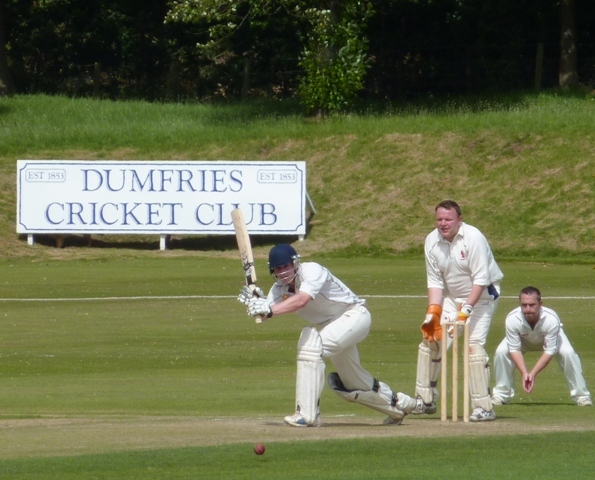 On Sunday, league leaders APD Dumfries maintained their unbeaten run with a convincing 111 run win over Weirs at Nunholm in National League Division 2. They amassed 298 for 3 thanks to a not out innings of 131 from Scott Beveridge and 95 from Tom McBride. 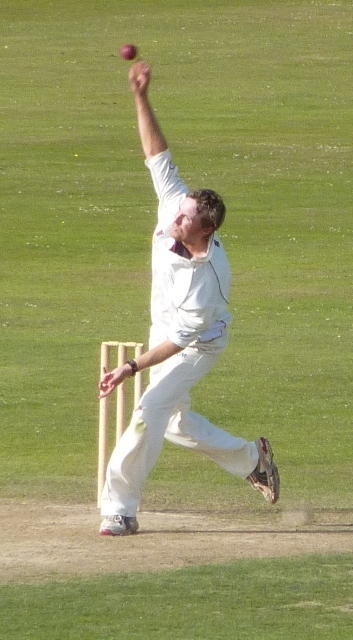 Then Jerry Goodin spun his way to five wickets as Weirs were bowled out for 187. Dumfries won the toss and chose to bat in hot sunny conditions. However the Weirs opening attack of Shah and Srivinas bowled well and found enough life to give the Dumfries openers an awkward start and it was Srivinas who achieved an early breakthrough bowling Parkinson cheaply. Fellow opener Tom McBride and Scott Beveridge then proceeded to bat circumspectly and after twelve overs the side had reached just 23. With a change of bowlers the pair started to find their form and the gaps in the field. Beveridge was the more aggressive as he hit Ashraf out of the attack with three successive fours. McBride played the foil to Beveridge’s sabre rattling as they gradually got on top of the Weirs attack with the hundred passed in the 24th over. Thereafter the pair, and Beveridge in particular, picked off boundaries to accelerate the scoring rate up from four an over. Weirs introduced the canny left-arm spin of Young to gain some control and he bowled well to test the batsmen. However from being well behind Beveridge in runs scored 18 year old Tom McBride started to accelerate rapidly as he demonstrated his range of shots. The pair reached an excellent two hundred partnership in the 41st over and the question for the spectators being well entertained was who would reach their century first. That was to be Beveridge with his first league century of the season but, with a push for runs in the closing overs, McBride disappointingly fell just five runs short when he was bowled attempting to sweep the off-spin of Murray. That was with the score one short of the 250 and ended a 237 run partnership. The pair had survived chances during their innings for which Weirs were made to pay very heavily and had batted superbly. Josh Geary came in with five overs left to support a weary Beveridge and contributed a rapid 21 before being run out. 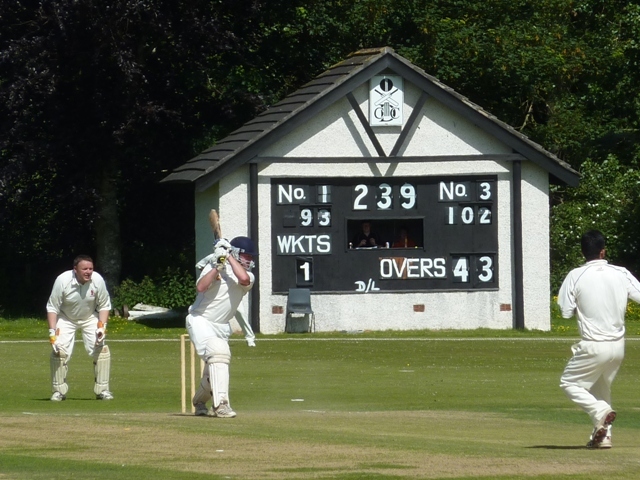 Dumfries smashed nearly fifty off the last five overs and Beveridge was undefeated at the end on 131 with the side finishing just short of three hundred at 298 for 3. In reply Robert McBride got Huyser caught at mid-on off a short delivery in his second over but Weirs carried on where Dumfries left off as the ball sped to the boundary. Murray was batting beautifully as he dominated the scoring and it took an early introduction of Beveridge’s spin into the attack and a reaction catch from Parkinson close in front to remove him for 41 with the score at 76. Beveridge and Patterson then bowled in tandem to restore control to Dumfries. Patterson bowled Hanif, and had opposition skipper Barnett smartly stumped by Corbett-Byers. Akram was batting well and he took the score on past 140 when Goodin replaced Beveridge. His aggressive spell of leg-break bowling then proceeded to take the next three wickets in the space of just three overs and two overs later he bowled Akram for a valiant score of 70. Geary came back on to take a wicket and appropriately Goodin took the last wicket caught at long on to complete a 5 wicket haul for 35 runs and the team’s seventh victory. On Saturday JMS Nunholm beat Langloan by 6 wickets away at Drumpellier in Western Union Division 2. Langloan scored 159 for 7 and JMS Nunholm successfully chased the total for the loss of four wickets. Langloan chose to bat first and it proved to be a innings of two halves and in the first half they found runs hard to score. 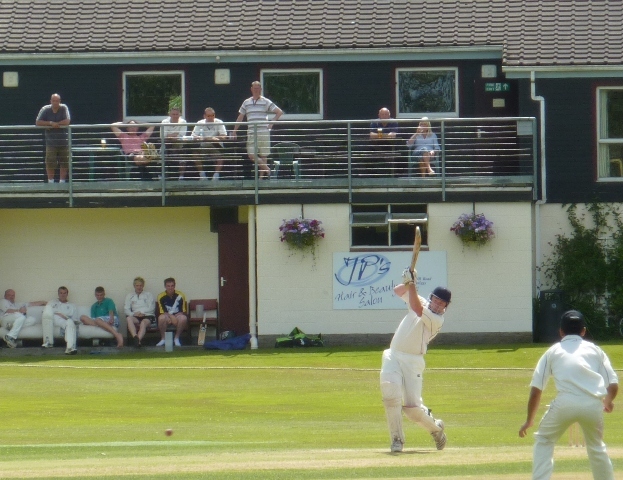 Chris McCutcheon took an early wicket caught behind by Cross and with his opening partner Niall Alexander generating good pace, including a run of three maidens, Langloan found it hard to make progress and when the first bowling change came they were 16 for 1 off 11 overs. That passage of play continued as Robert McBride and Davie Davidson bowled in tandem. The first boundary only arrived in the 23rd over. Then Davidson dismissed opener Bryson for a stubborn 22. McBride dived to his right to take a brilliant caught and bowled and after 30 overs Langloan were languishing on 46 for 3. However the occasional lifter had hit a couple of players and had made batting uncomfortable. In the second half runs started to come more easily for Langloan. McAtler with 23 and Begley with 18 pushed the scoring along to 80 for 4 with ten overs to go. Then with a combination of extras, boundaries, and good running, Langloan succeeded in adding nearly eighty runs in those remaining overs to reach a useful final total of 157 for 7 with extras amounting to almost a third of the total. McBride finished with three wickets and McCutcheon two. In reply Nunholm had a steady start with openers Farries and Johnston passing the fifty mark in the 13th over. After hitting several boundaries Johnston played round a full delivery and was bowled by Abri for 29. Andrew Batty arrived at the wicket and played an enterprising innings to take the side past the hundred mark by hustling for another 29 runs before he ‘played several times’ at a slower short delivery and was bowled. Davidson was the next man in and he started with a series of driven boundaries and one booming six over midwicket. It looked like this pairing would see Nunholm over the line until Davidson was caught in the off-side for 38 with another ten runs needed. Nunholm lost one more wicket before a bye provided the winning runs in the 39th over. Farries carried his bat for a secure, if soporific, 48 not out to see his side through to the win.